Every fall, Greenwich Village’s permanent residents gain a fresh batch of new neighbors: undergrads. New York University and The New School seem to expand their reach with every passing semester, often to the chagrin of the millionaire townies who can afford to make the Village their home. Sure, there are colleges and universities all over NYC, but downtown’s countercultural history makes it a magnet for college kids. With the sudden influx of the future titans of American industry (and their parents’ money), restaurant reservations, bar seats, and even cafe tables seem harder to come by. Given the seasonal scarcity, locals need to make their dining and drinking dollars count, and even the starry-eyed newcomers deserve a few tips on where to eat and drink during the supposed best years of their lives. Whether you’re a resentful local or an overeager newbie, these are the best bistros, pizza places, farm-to-table kitchens, date spots, and red sauce joints in Greenwich Village. Fresh bagels are not meant to be toasted. 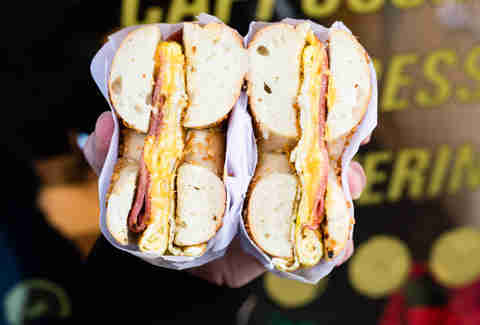 Anyone who orders a toasted bagel in NYC lacks good taste and any sense of what is good in the world. In response to whiny customers, Murray’s gave in to the toasting lobby a couple of years back, and now warms its bagels on request -- though, again, don’t. Toasted or (preferably) not, these are the best bagels in the area, with a light golden crust and dough chewy enough to keep your dentist in business (which is just the way it should be). Japonica started serving sushi in 1978; 40 years later, it’s a neighborhood institution with a fierce local following. They might have downsized a couple of years ago, but their commitment to the craft remains the same. The extensive menu is dotted with teriyaki and miso soup, but stick to the sushi and house specials. No visit is complete without the Japonica Invention, a roll so stuffed with tuna, slices of avocado, and bright red fish eggs that it’s almost impossible to lift with chopsticks. Once a cramped space in a bustling Indian community over on Avenue B, Babu Ji recently relocated to a two-story location in Greenwich Village. It’s still decked out with Indian paintings and a projector playing Bollywood movies, as well as a self-serve beer fridge on the second floor. Chef Jessi Singh serves up a combo of street food and modern Indian -- highlights include Colonel Tso’s cauliflower (an Indo-Chinese fusion of flash fried cauliflower in a spicy tomato and chili sauce) and the famous, wonderfully inauthentic butter chicken (yogurt-marinated chunks in a bright tomato, ginger, garlic, and fenugreek curry). Order it à la carte, or through the $62 tasting menu. MIMI is nestled into a quiet nook of Sullivan Street, but it’s anything but muted. The tiny bistro has just a dozen-or-so tables, and each one is highly coveted, as proven by the line spilling out onto the street. It’s a little bit of France in the Village -- the quiet particularity of the food, the staff rattling away in French, the hand-written chalkboard menu, the windows flung open in warm weather. Once you manage to get a seat, gorge on the classic French fare: smoked duck rillettes to share, crispy boudin noir with apple puree, and buoyant rounds of gnocchi resting on a bed of sunchokes and Enoki mushrooms. Chef Dan Kluger (formerly of ABC Kitchen and ABC Cocina) creates dishes for his seasonal menu based on what’s available at the greenmarket. Everything is made to share, like the wood-grilled broccoli salad with pistachios, orange, and mint, and the sweet-and-sour house-made cavatelli pasta with duck and charred cabbage. 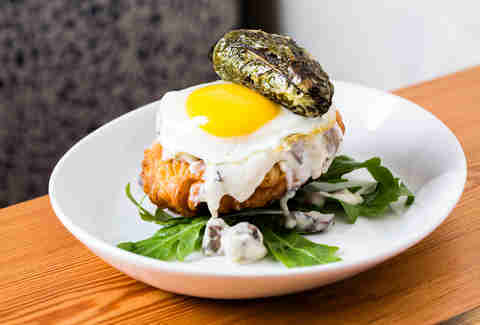 It nails dinner and lunch, but really excels at brunch, with eccentric specialties including cheddar waffles and eggs, and crunchy French toast coated in cinnamon crumbs and chocolate. 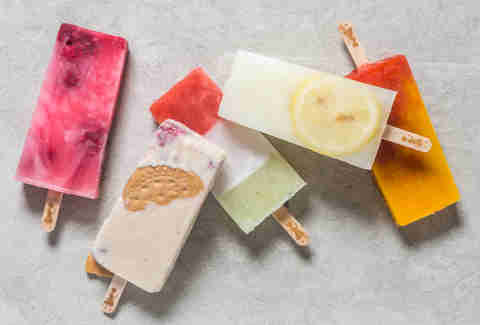 Mexico native Fany Gerson (founder of Dough) first set up La Newyorkina as a simple market stand selling paletas -- Mexican-style creamy, spicy, or fruity ice pops. Nowadays the shop has a brick-and-mortar location, and has expanded its offerings too, with nieve de garrafa (handmade Mexican sorbet) and traditional ice cream on the menu. Flavors come in the likes of mango chili, horchata, and roasted banana; you can also go all-out for an ice cream sundae extravaganza, drenched in Oaxacan hot fudge, spiced pumpkin brittle and/or galletas. This cozy, sleek wine bar is a popular haunt among Francophiles and actual French folks, alike, with its exhaustive menu of native wines. It’s the kind of place where you pair the food with the wine, rather than the other way ’round. In any case, they’re a perfect match. On the menu are the likes of chicken liver mousse, beef tartare swirled with a quail egg, duck leg confit, along with cheeses and cured meats to share. Très, très bien. This bright, breezy brunch restaurant from the people behind Rosie’s and Cookshop pops open its floor-to-ceiling windows in the warm weather months. 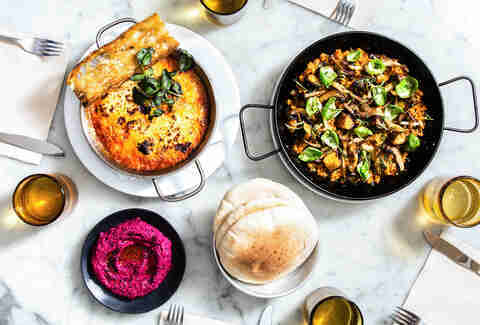 The menu draws from around the Mediterranean: there’s an array of small dips (beet tzatziki, whipped feta, labneh), along with hearty kebabs (grilled lamb, spiced yogurt, and sumac onions, served with pita), and the ever-popular shakshuka. Order the cinnamon rolls for the table, or the chocolate babka French toast, stuffed with milk chocolate streusel and blackberries. 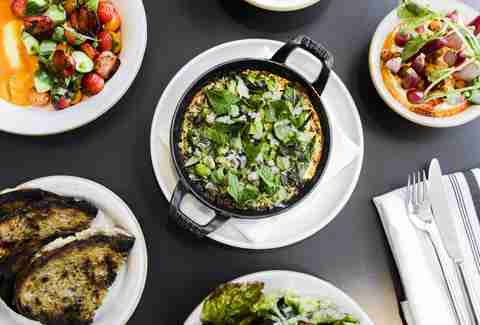 Nix is a bona fide vegetarian restaurant -- that much is true. But while vegetables are at the forefront of the menu, it doesn’t mean everything is necessarily healthy. 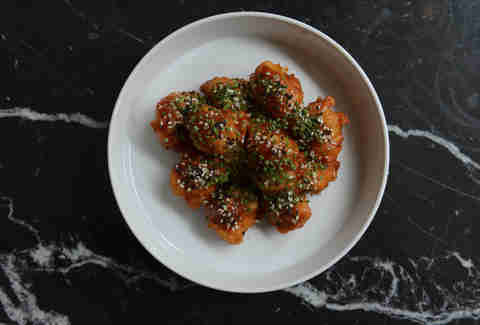 General Tso would be proud of the cauliflower, which comes fried in soft, half-moon steamed buns. Tandoor bread (made in the tandoori oven left by the previous tenants) is served with house-made hummus, pistachio-topped labneh, and spiced eggplant. The shiitake cacio e pepe is poached in butter and tossed with creamy polenta. It’s certainly possible to dine healthily here, but it’s more fun not to. Fashioned after a private home, Fairfax’s seating areas are eclectic. Guests can settle into a cozy breakfast nook-like space with the paper, pound out that screenplay on a long sofa, or gather with friends in mismatched armchairs. 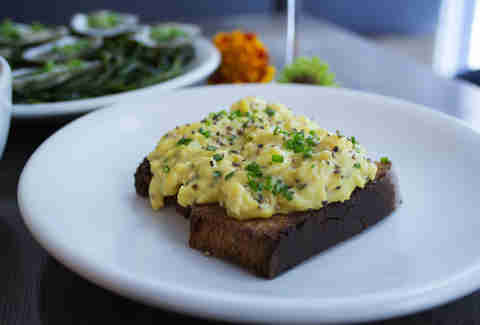 Perfectly pulled espresso pairs with pastries and egg dishes in the a.m, and later risers can combine a small plate (think sardine crostini, steak tartare, or the house burger loaded with pimento cheese) and a glass of wine for $24. Newcomer Pasta Flyer is on an under-the-radar strip of Sixth Avenue, priming the area with an appetizing alternative to the restaurant pit on 14th Street. The innovative fast-casual pasta spot is helmed by Mark Ladner, formerly of Del Posto and several other Batali-Bastianich collaborations. 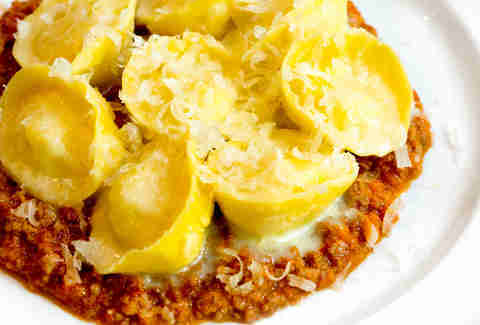 Here, his focus is creating high-quality Italian dishes at startlingly low prices. The concept is simple: Select a pasta (fusilli, rigatoni, penne) and pair it with a sauce (pesto, alfredo, marinara, ragu), for a super-quick sub-$10 meal. 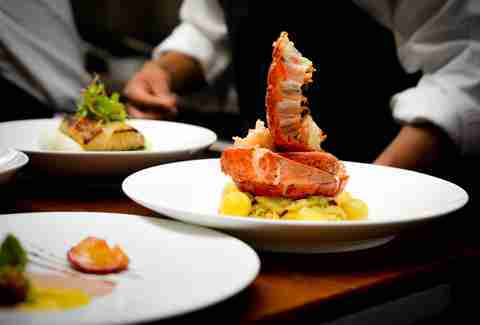 Alfred Portale’s Gotham Bar and Grill is a timeless ode to haute, market-driven cuisine. It’s classically elegant, with impeccable hospitality delivered by smart-suited staff -- in short, this is the place to celebrate an anniversary or promotion. “Vertical presentation” was pioneered here, and the yellowfin tuna tartare is the signature example -- a tower of miso-flecked tuna is stacked alongside crusty bread, rising 8 inches off the plate. The rest of the menu reads New American, with a wine list as thick as a brick -- and don’t miss out on the $38 Greenmarket lunch, a three-course prix fixe meal that shuffles with the seasons. We could wax poetic ad infinitum about the storied slices at Joe’s Pizza. 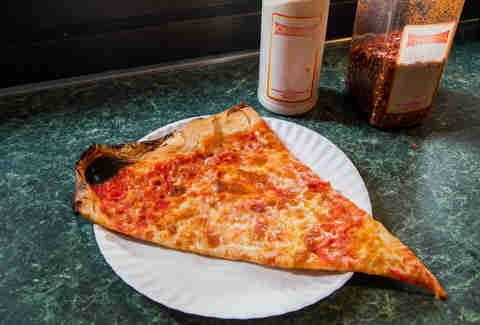 This is NYC pizza through and through -- its texture is prime for folding, it’s just greasy enough, and it arrives on flimsy white paper plates in exchange for cash-money. The neighborhood joint stays open late, as do its more recent outposts in the East Village and Williamsburg, but any connoisseur will tell you that the slices are best at the Village location. 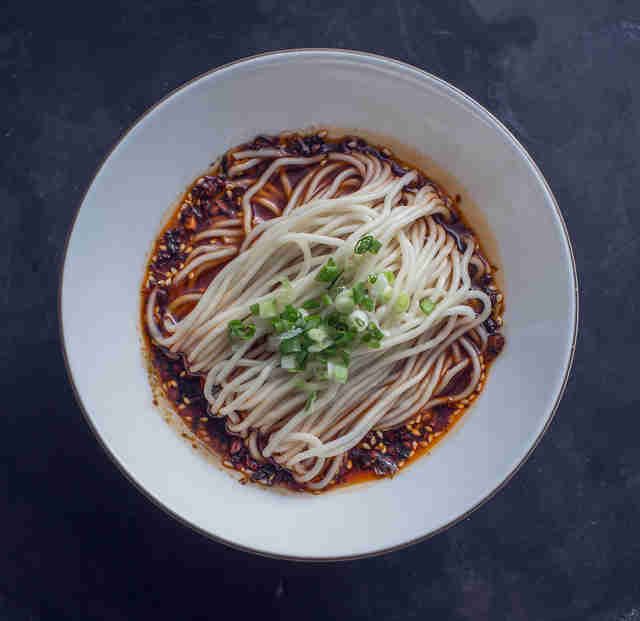 Hao Noodle and Tea has an upscale charm without resorting to the gimmicks that plague certain Chinatown restaurants which shall remain nameless. Come for the clay-pot dumplings (half-moon omelets stuffed with pork and water chestnut, in chicken soup), and the spicy dan dan noodles, which are done just how they are in an actual Chinese food market. With a name like Strip House, it’s only natural for this ever-so-sultry steakhouse to be decked out in red velour booths with black-and-white burlesque photos hanging on the walls. 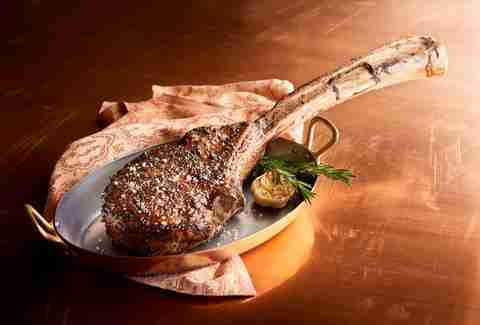 Yes, the many cuts of steak are all on-point, the crispy potatoes are roasted in goose fat, and black truffles are folded into the creamed spinach -- but it’s the unmistakable downtown vibe that makes this steakhouse stand out from the haughty uptown-ness of The Palm or Smith & Wollensky. The original Chumley’s boldly opened during the Prohibition-era, and endured as a sanctuary for stars of arts and letters during its successful 85-year run. Now, after a decade out of operation, portraits of former guests like Edna St. Vincent Millay and F. Scott and Zelda Fitzgerald decorate the upscale iteration of this formerly ink-stained wretch-accessible space. 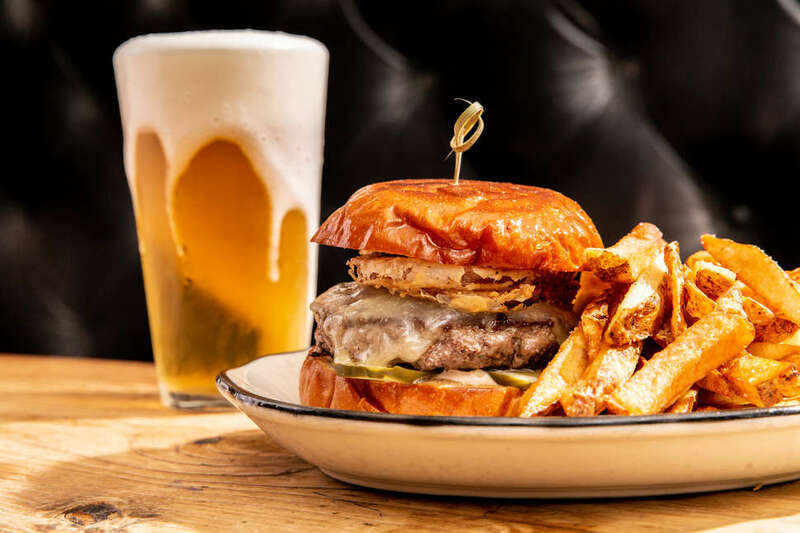 Any one of the half dozen Scotch and soda combos will sip nicely with the much-ballyhooed burger with bone marrow, American cheese, and Chumley’s sauce. The kitchen at newcomer Villanelle concocts vegetable-forward farm-to-table dishes. The menu reads like a list of seasonal ingredients available at the greenmarket: summer squash, nasturtium, huckleberries, tomatoes. Plates are on the smaller side and made for sharing -- one snack, small, and large dish is recommended per person. If it’s drinks you’re looking for, station yourself at the wood-paneled bar and let the expert bartender craft you a cocktail built of gin, fresh pea juice, and elderflower. 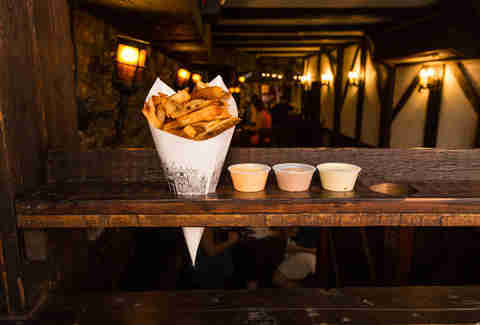 After a fatal explosion in the East Village destroyed the old Pommes Frites, they’ve since reopened among the beer-soaked bars and comedy clubs of MacDougal Street. It’s the same kind of space -- a cramped, dark wood-paneled spot burrowed down in a basement. With limited seating, it’s basically a counter-service operation, but that’s OK because the only move here is Belgian fries. They’re fried twice -- once to cook the potatoes, and the second to give them that crisp finish. Pair your cone of fries with one of 30 sauces, including red pomegranate teriyaki, organic black truffle, and Cheddar cheese. If it isn’t Mario Batali and Joe Bastianich’s worldwide reputation that brings you to Babbo, then it’s the always flowing carafes of wine, or the superlative sweetbreads, tripe, and fresh pasta. 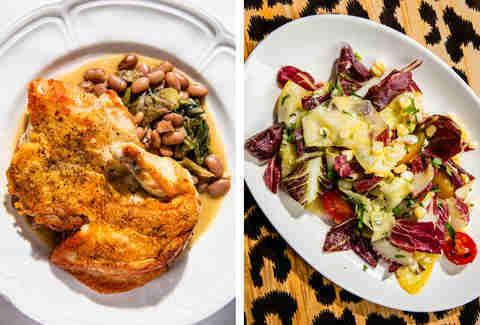 It’s Babbo, after all, that made the NYC restaurant scene what it is today: a kooky juxtaposition of fine dining, coupled with bar food and a soundtrack of rock music -- a move that in 1998 was entirely unheard of, yet now has become standard practice. There’s no place like Carbone: For a start, they’ve got the tile floor you’ve seen in The Godfather, but there’s also the unique charm of captains bounding about in suits and bowties, and the old-world thrill of tableside presentation. And then there’s the food -- a homage to New York’s Italian restaurants of yesteryear, with every kind of parm, and pastas drenched in alfredo sauce. But Carbone is that and so much more -- it’s an elevated red sauce joint, also serving the likes of lobster fra diavolo peppered with Calabrian chiles, and spicy vodka rigatoni. Dan Barber’s landmark ode to New York’s terroir epitomizes the farm-to-table revolution -- here, vegetables carry just as much prestige as meats and fish, the wheat is grown to the chef’s particular standards, and the single-udder butter owes to the cows who graze at Barber’s farm just outside Tarrytown, New York. The cooks are known to improvise in the kitchen, depending on what’s available on any given day -- one thing’s for sure, you’ll never have the same meal twice. Locals mourned the loss of the legendary Caffe Dante, but the new owners have revamped the menu with small plates (salads, sourdough flatbreads, house-made pastas) and an extensive cocktail list -- including a dedicated section for negronis. 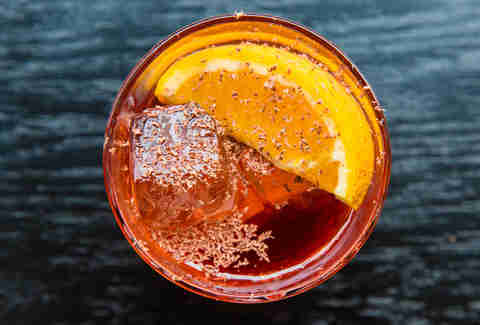 Try the Old Pal with Wild Turkey rye, the Sparrow with cognac and hazelnut, or any of the other dozen $10 options. It’s an ideal spot for a first date or early evening gathering with comrades. An old-fashioned bicycle parked outside of Buvette makes it look like the sort of place you’d discover on vacation in the 13th arrondissement. Inside, waiters dart between packed, round tables, ferrying French 75s and eggs steamed to airy perfection with the bar’s espresso wand. 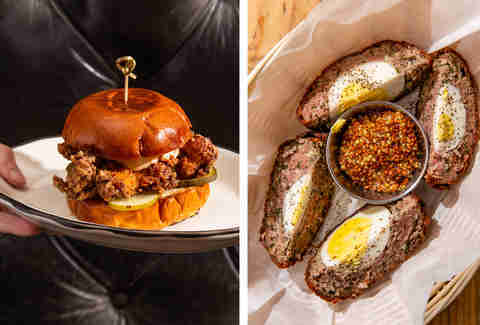 The no-reservations neighborhood favorite trades in French classics like coq au vin and moules au frites, alongside the newly ubiquitous avocado toast and a novel waffle sandwich. Wilfie & Nell is effortlessly romantic. Sunshine streams through big windows up front during the day, and candle light bounces off distressed exposed brick after dark. Around dinner time, the local haunt is a prime locale for casual cocktails and a reliably tasty meal. A steak and spinach salad comes loaded with roasted corn and cotija, a cucumber gimlet arrives dusted with black pepper, and the Murray’s board, crowded with cheese from the nearby vendor, is the perfect first date shareable. Post 10pm, the place livens up with a more adult (and slightly lower key) crowd than the one you’ll find in the East Village. This is the place to abandon your zucchini noodles, your quinoa penne, and your carb inhibitions. Genuine gluten dishes like rigatoni with turkey sausage, peas, and cream, homemade pappardelle with smoked bacon, and real penne with meat sauce make up for the celebrity hangout’s cash-only, no-reservations inconvenience. If life were a rom-com, you’d duck out of a torrential downpour and into this cozy spot at the exact same time as a disconcertingly attractive stranger, with whom you’d soon find yourself sharing a meal at the bar. You’d dry off under the space’s golden lights, and warm your hands over a candle’s flickering flame. You’d laugh over oysters, roast chicken, steak frites, and maybe a bottle of sparkling wine, to toast your good fortune, and your new one and only. Once upon a time, you’d find Ernest Hemingway, Dylan Thomas, and E.E. Cummings tying one on at Minetta Tavern. Today, you’re more likely to squeeze into a red leather banquette and rub elbows with yuppie couples and e-marketing agency partners noshing on roasted bone marrow, escargot, and one of the best burgers in NYC. The place has taken a turn for the upscale in its 81 years, but even after Keith McNally’s 2008 takeover, it remains an honorable facsimile of the original. Amy Schulman is an Editorial Assistant at Thrillist who was born and raised in Greenwich Village. She can often be found powering down sushi at Japonica. Follow her on Instagram. Eliza Dumais is a born and bred South Brooklynite with a deeply unsophisticated palate. Follow her for pictures of things that probably aren't food: @elizadumais.